The 3rd album of Antagon is a real 3rd strike. 10 tracks of modern Psytrance with a BPM ranging from 167-180 coming in a wave of constant groove, flittering noises, crazy melodies, with total machine power, in summary: Belief Engine. 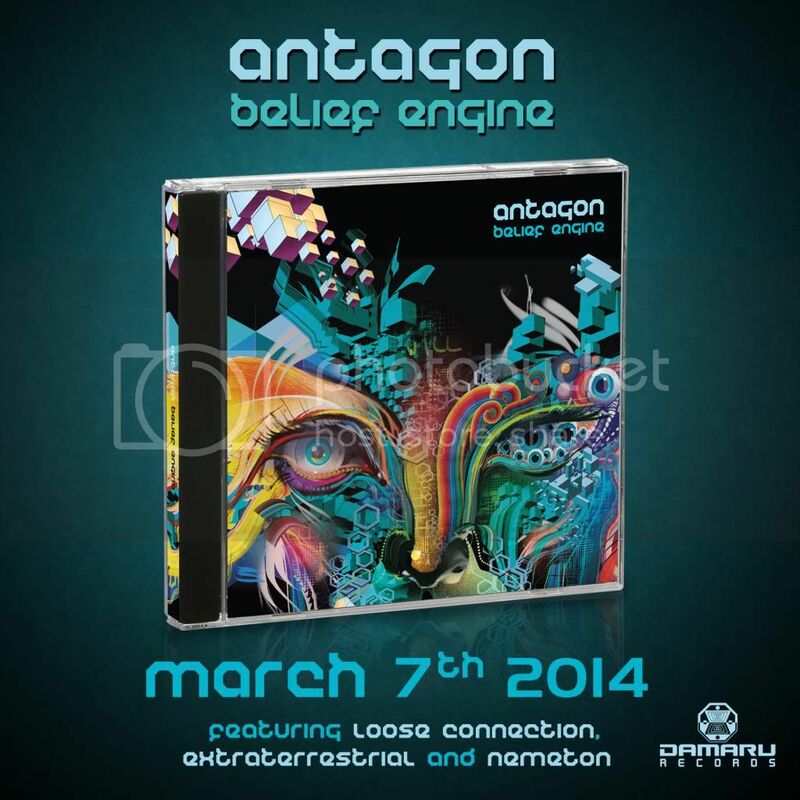 Antagon´s musical development is awesome, he has always been a master of intelligent Psytrance, he has now come to the point where he has developed a very unique style. His choosen sounds - hardworking and straight rhythms, the special breaks, influences from Death Metal, EBM/Industrial are formed and melted into specific arrangements. On top there are sparks of classical tunes, sometimes small pieces with Dubstep elements alongside marching grooves creating a mindblowing fusion. Crash (169) is a funny track. Imagine a machine running from left to right, and sounds from all around, accompanied by a smooth and deep soundlayer, which teases you and avoids the crash you are waiting for the whole time. This kind of humour is typical Antagon and you can find it from the begining of his productions. Lunatic Fringe (169) even has melancholic Techno orientated parts, which are completely destroyed in the right moment, just to show us where to dance. For example the title track Belief Engine (175) starts with a kind of mystic power, interrupted but is completely fullfilled by smooth breakcore sounds, it then leads you into a tunnel of groovy power. In this track all these elements from above are perfectly combined in an arrangement with a lot of different emotions. There are also some very interesting collaborations happening on this album. For instance one with Extraterestrial - Voyager (178). This is a collaboration to be heard, these guys are together are a force to be reckoned with. There are more collabrations such as Nemeton and Limbertimbre giving the album this special taste. Knowing that he is f@#king busy producer; the choices of these tracks are perfect. It´s a 3rd album, always special for any artist, but Antagon´s concept makes me hungry for the next chapter of the story. Before that, we have a lot to dancing to do. Last edited by Damaru Records on Sun Apr 13, 2014 8:17 pm, edited 3 times in total.